Increasing?people use WhatsApp as a communication tool nowadays. 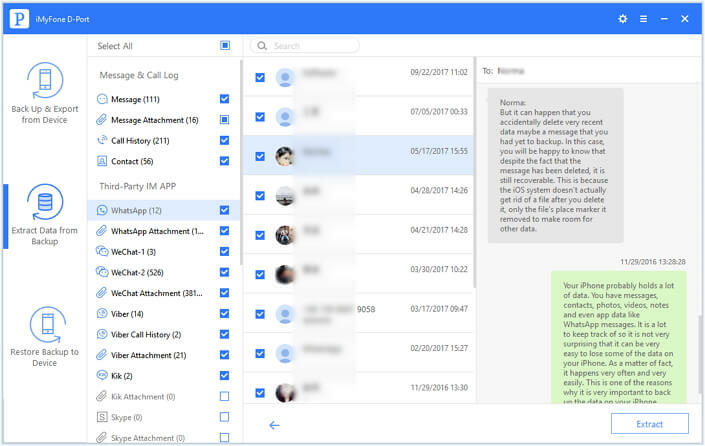 Some even use it to share and transmit important information or files, so it is very important for them to keep WhatsApp data safe and avoid data loss. Backing up WhatsApp data to iTunes or iCloud is a good idea but not the best option. 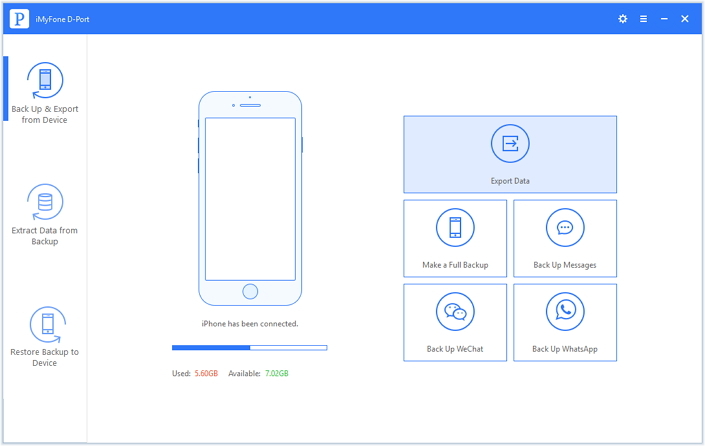 You will have to replace all the current data on iPhone to get back the WhatsApp messages by restoring a complete iTunes/ iCloud backup to your iPhone. Hence, is there a way for users to export the important WhatsApp messages on iPhone? 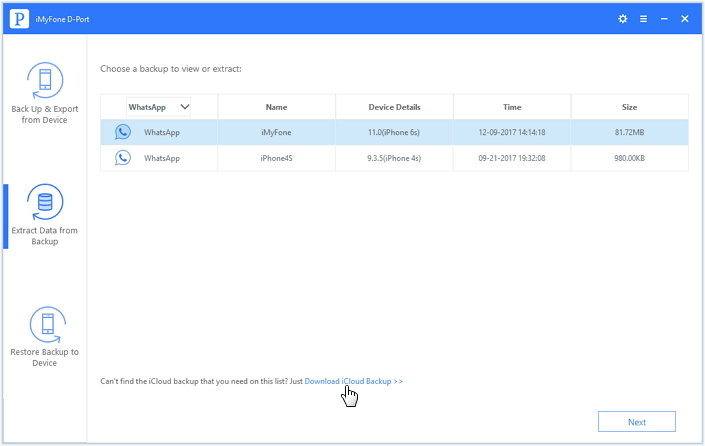 This article will provide you with 2 solutions to extract WhatsApp history from your iPhone or iTunes backup, iCloud backup easily (iOS 11 included). One way to save your WhatsApp messages is to email them to yourself. Follow these simple steps to do it. Step 1: Open WhatsApp and the conversation you want to save. Step 2: On the navigation bar, tap on the contact or group's subject. Step 3: Scroll to find "Export Chat" and tap on it. Step 4: Choose if you want to attach media or if you want to email the conversation "Without Media". Step 5: Select the main app, enter your email address and tap "Send" to finish. Support iOS 11/10/9/8/7 running on iPhone 8 Plus/8/7 Plus/7/SE/6s Plus/6s/6 Plus/6/5s/5/4s. This tip is useful for those who hold a backup file in iTunes or iCloud. 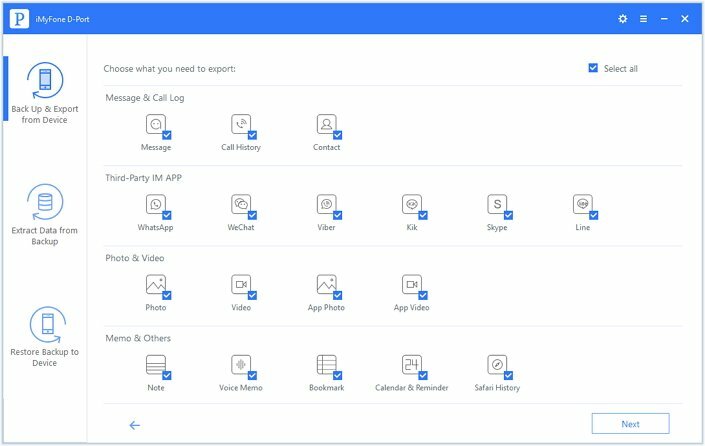 Let us take iCloud backup as an example and list the procedures to export WhatsApp history from it. Step 1: Install iMyFone D-Port. Start the program after completing the installation procedure. From the main window, select "Extract Data from Backup" option. Click "Download iCloud Backup" to proceed. Step 2: Login to your iCloud account by filling the details. 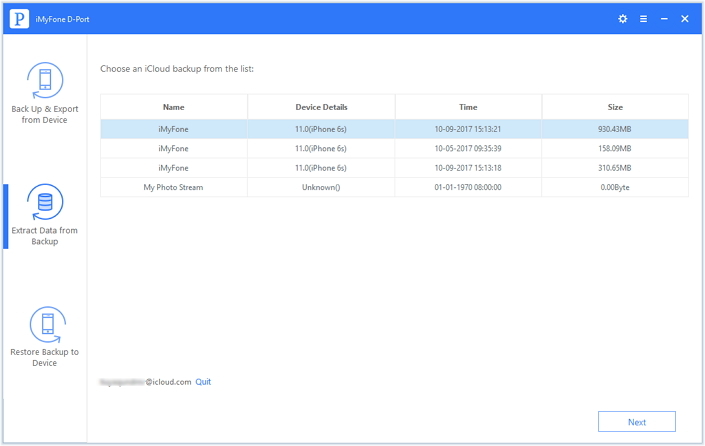 The software package will then check iCloud backup files within the account. After that, choose the recent file from which you would like to extract WhatsApp data. Press the "Next" button. It will allow the program to download the selected iCloud backup file. Step 3: Choose "WhatsApp" as the file type that needs to be exported. 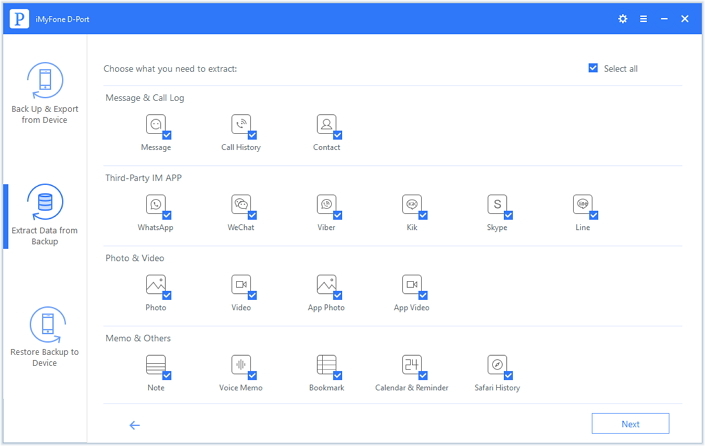 Step 4: After download and scan are completed, iMyFone D-Port will display the WhatsApp history on its interface. You can preview the conversations and select the needed ones accordingly. Press the "Export" button to export them onto your computer. Pick the destination folder to save the exported data. The process below will be helpful in extracting WhatsApp messages directly from an iPhone. Step 1: Connect your iPhone to the computer. From the main window, click "Backup & Export from Device" option. Continue by choosing the "Export Data" option. Step 2: Click "WhatsApp" under third-party IM app in the next screen. After that, tap on "Next". Step 3: Then the program will start to scan all the WhatsApp data on your device. Please kindly wait for it. Step 4: After the program finishes scanning the device, it will display all the messages on the preview interface of the program. You can select the information you want to extract by pressing the "Export" button. A small window opens up asking you to pick up a destination on your computer to save the conversations. 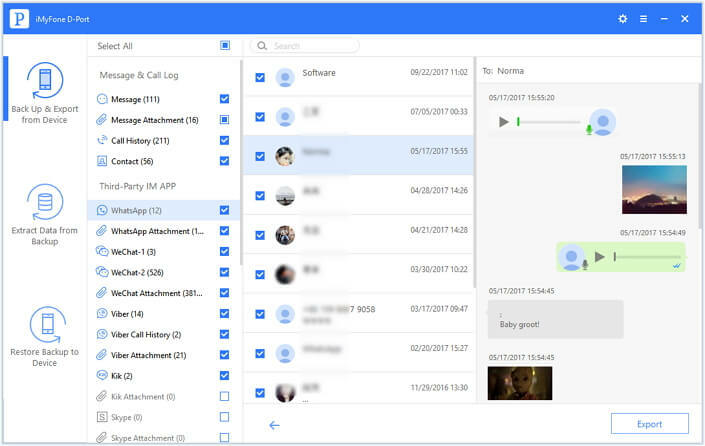 You can choose an existing folder or create a new one. After the extraction completes, you can browse the folder to see the exported WhatsApp messages from your iPhone. 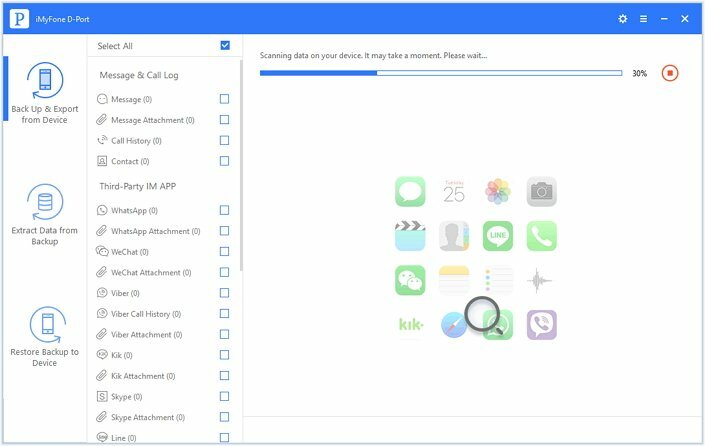 iMyFone D-Port, fully compatible with iOS 11, gives an excellent opportunity to extract your existing WhatsApp messages from iOS device or iPhone backups with ease. Just have a try and you will find it really efficient and easy to use.